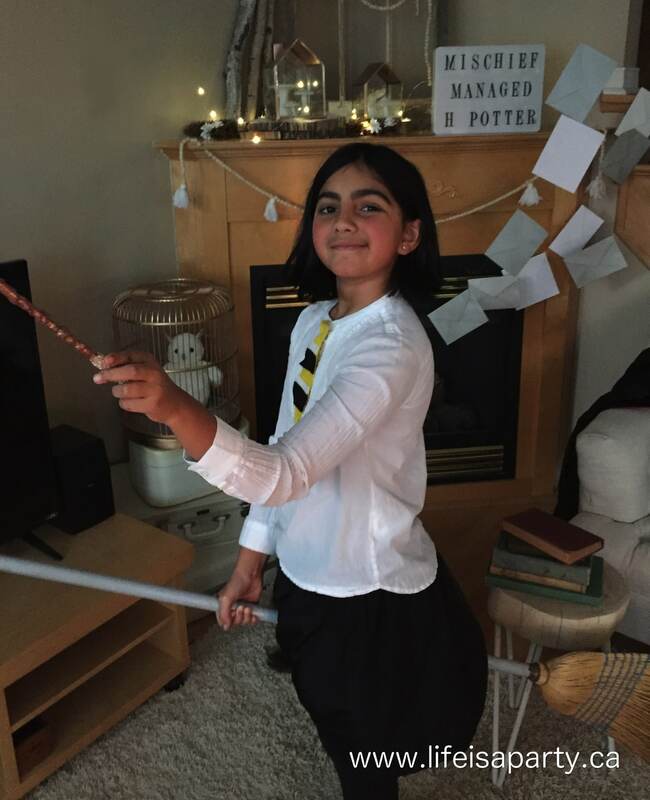 Over the last few months, my daughter Paige has been reading the Harry Potter books. So we’ve started watching the movies together as she finishes each book. Over the Christmas break we enjoyed the first three together, and last Saturday we made a Family Movie Night out of the fourth Harry Potter Movie. 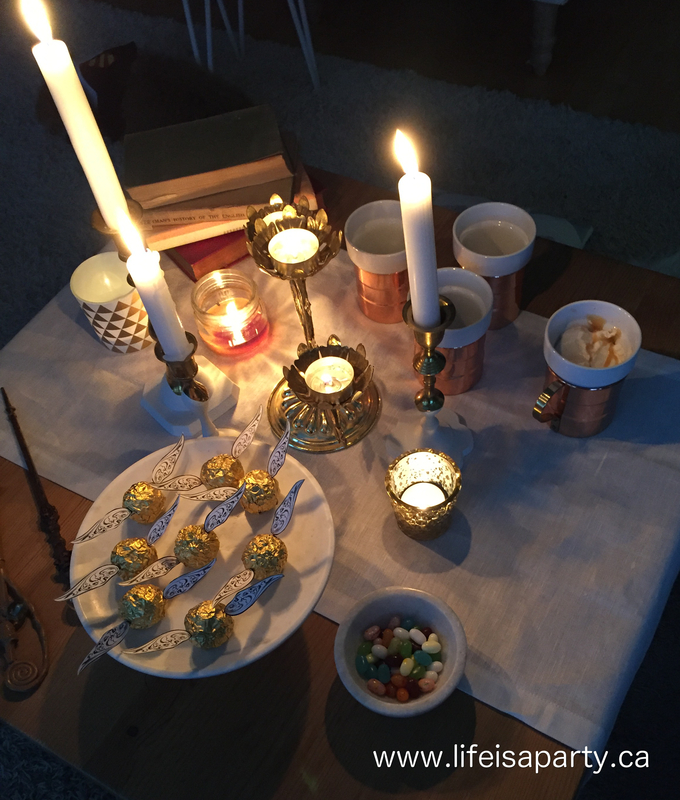 It was so much fun, that I wanted to share it with you and possibly inspire a Harry Potter Family Movie Night of your own. We didn’t have anything planned Saturday, and those are sometimes the very best kind of Saturdays. I knew we were planning to watch the next Harry Potter movie, since Paige had finished the book and when I was out shopping that week I noticed a package of Bean Boozled Jellybeans -they’re just like Bertie Botts Every Flavour Beans, so I picked them up on an impulse, thinking they might be fun for movie night. 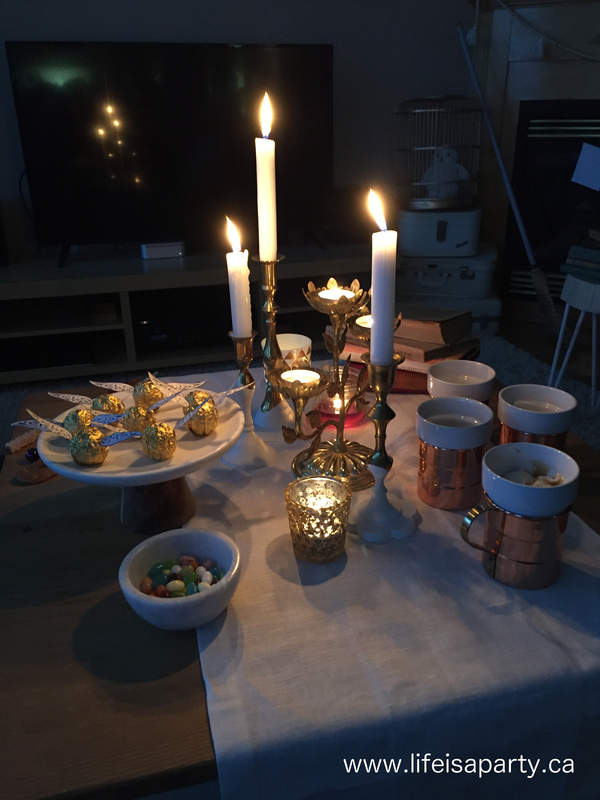 You know how much we love a theme around here, so I mentioned to the girls I’d picked up the jelly beans, and asked if they’d like to turn it into a family party. The apple doesn’t fall too far from the tree, of course they loved the idea of making it into a family party. 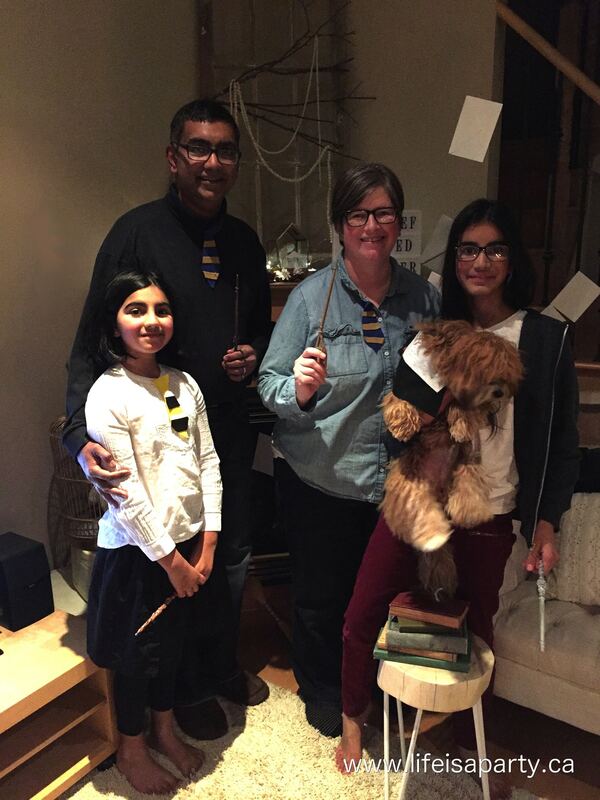 And so, our Saturday was filled with creating our little Harry Potter party. 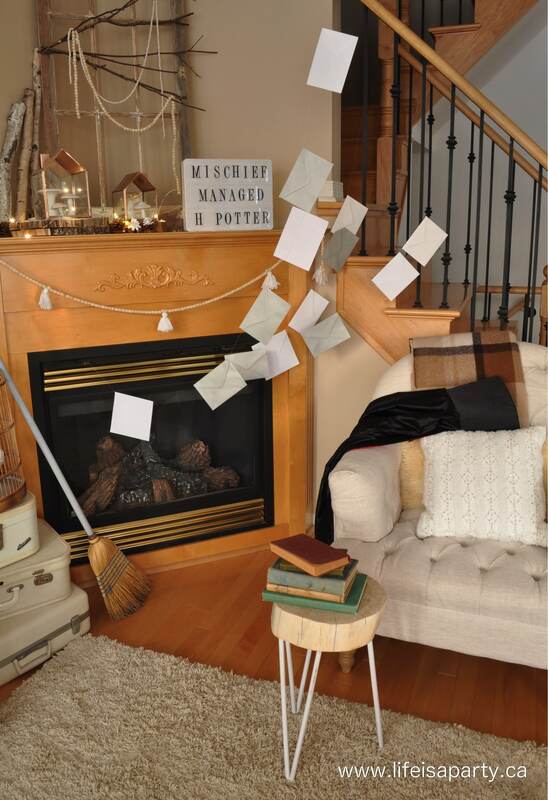 They decorated the living room with a few Harry Potter inspired things. 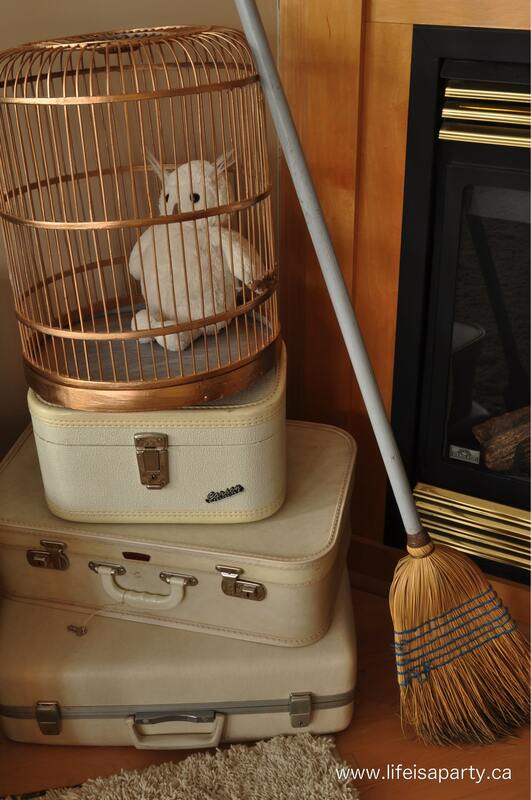 They added Harry’s luggage pile and owl Hedwig, along with a broom for flying -not exactly the Nimbus 2000, haha, but close enough. 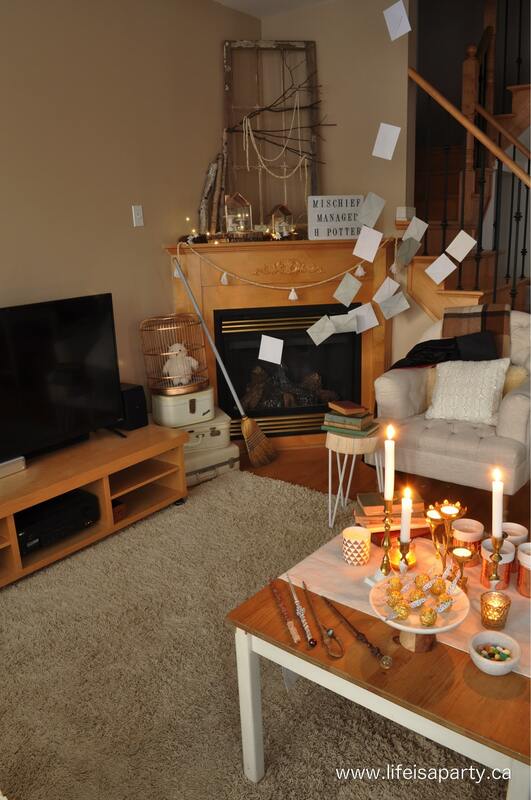 We were inspired by the scene in the first book where all the school letters come flying out of the fireplace, and added some letters on fishing line to our fireplace. On the side chair, is Harry’s cloak of invisibility. And up on the mantel, a favourite quote “Mischief Managed”. We often make homemade pizza for family movie night, so we enjoyed that with a salad for dinner, and ate in the living room watching the movie. To go with our pizza we made our own Butter Beer, and it was soooo good. 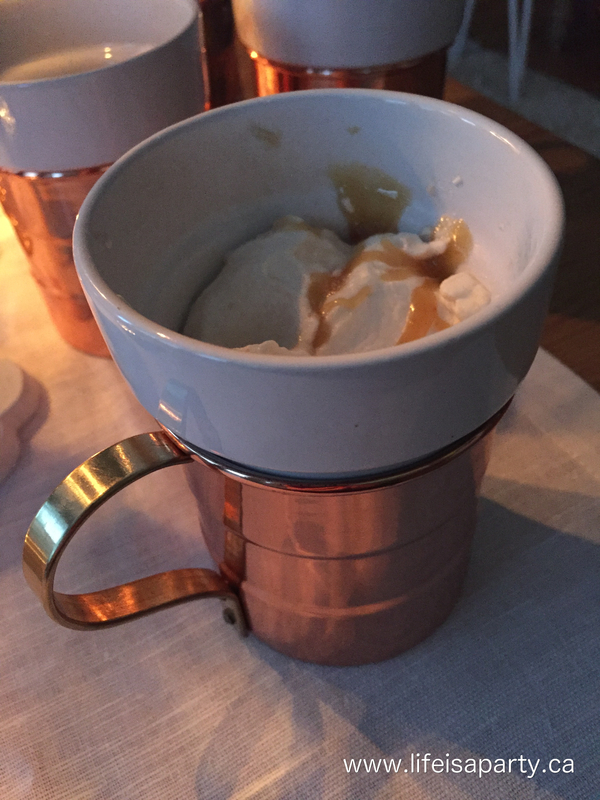 To make the Butter Beer, we combined a little bit of vanilla cream soda in the bottom of the cup with some butterscotch sauce, and stirred well to combine. Then we topped it with more cream soda. We added whipped cream to the top, and another drizzle of butterscotch sauce. It was kind of like a soda float, so good. 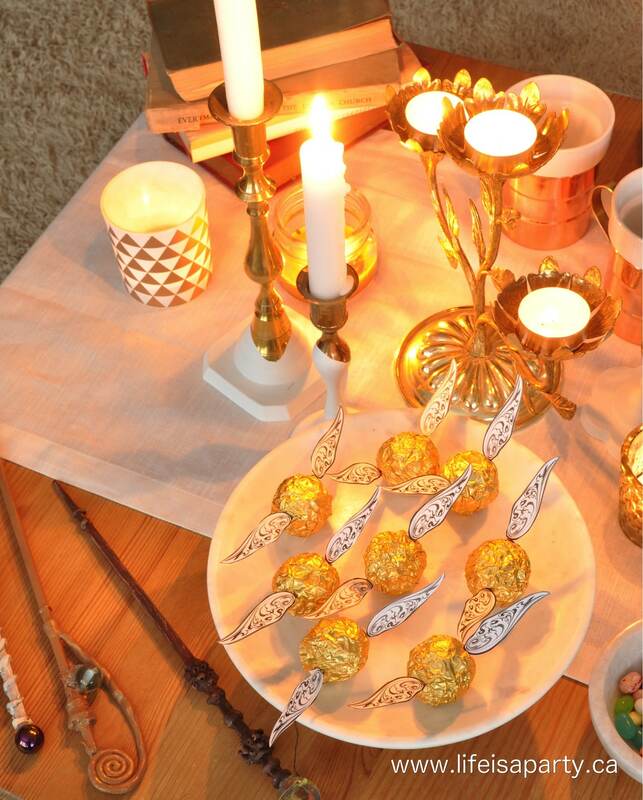 For our dessert, we made some golden snitches out of Ferrero Rocher chocolates. 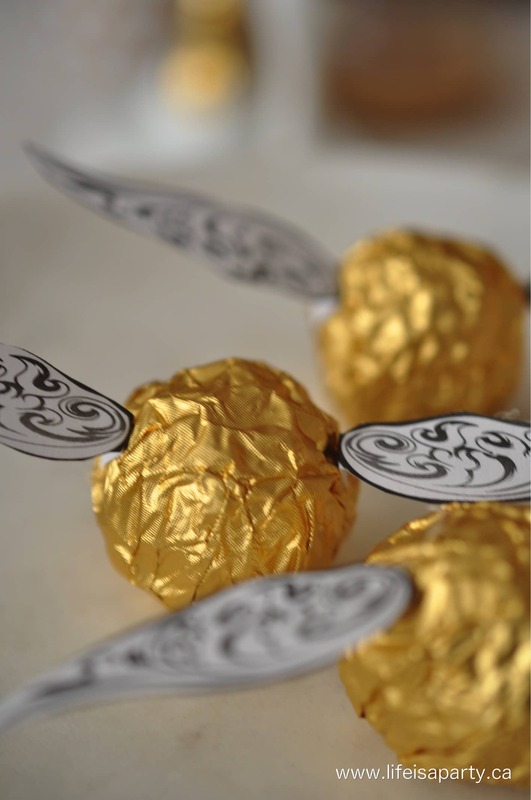 We used the printable wings from here, and hot glued them to the wrappers. We also ate the jellybeans. This was so funny. We put them all into a little bowl. You know that sweet smell you usually get when you open a bag of candy? Well it was certainly missing here, since the vomit, grass, and dog food jelly beans were mixed in there too. We took turns choosing one and seeing what we got. It was so funny to see some of the reactions to a first taste. And also funny to see who refused to play anymore after one round, haha. 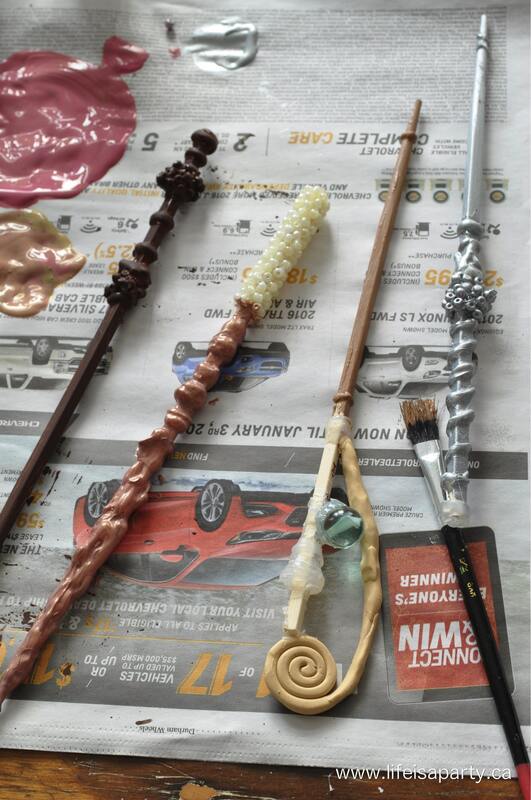 My girls spent most of the day before the movie working on their wands. 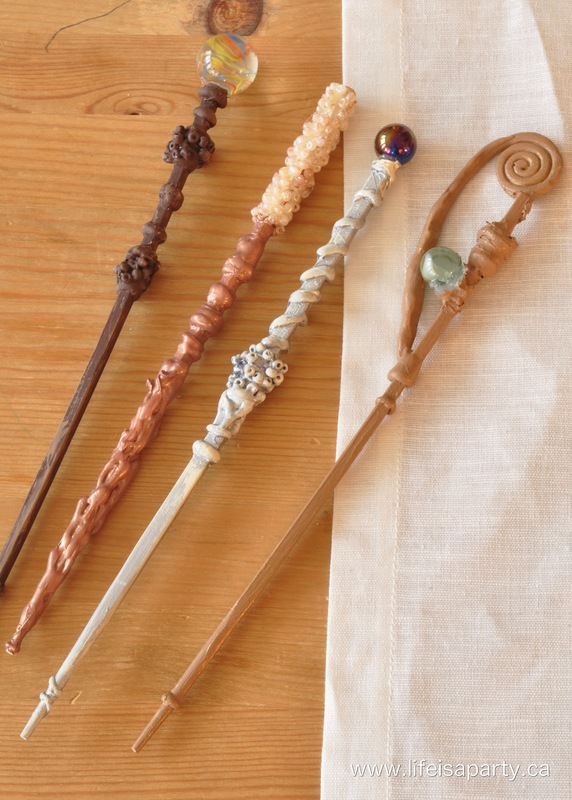 They used inexpensive chopsticks as the base for each one, and then added dimension with hot glue. Some of them also had beads added, and polymer clay details, or beautiful marbles. Once they were done, we painted them. They turned out so, so well. I think they were their favourite part of the day. The girls also made some costumes for us. 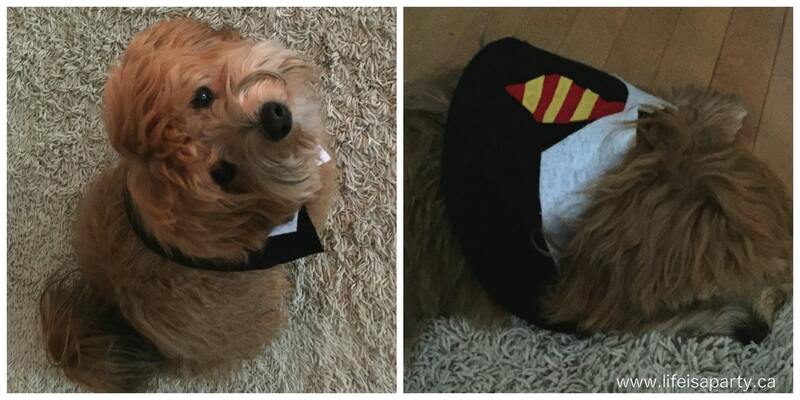 They made the sweetest little doggie Hogwarts uniform for our dog Oscar, out of felt. 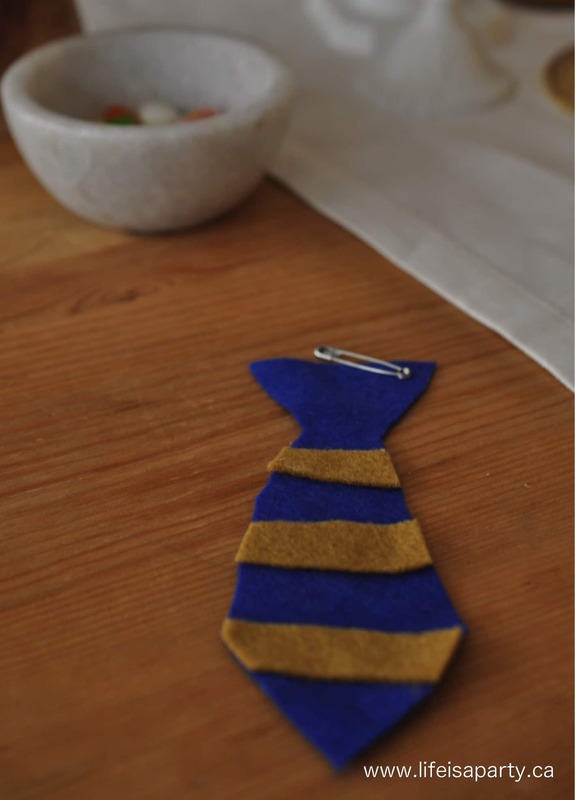 And for the rest of us, school ties to match our houses. We had all taken an on-line quiz before to see what house we belonged to. This was such a fun night, and I know we were making special memories too. It was almost all stuff we had around the house. I think the only thing I had to buy was the package of jelly beans. It’s a reminder to me that sometimes all we need is time enough to create something fun. Often our weekends are busy, or full of errands and jobs to do, but there is something special about a Saturday with no real plans,and all the possibilities it holds. As we say around here a lot, life is what we make it, so we may as well make it a party, and this is the perfect example of that. 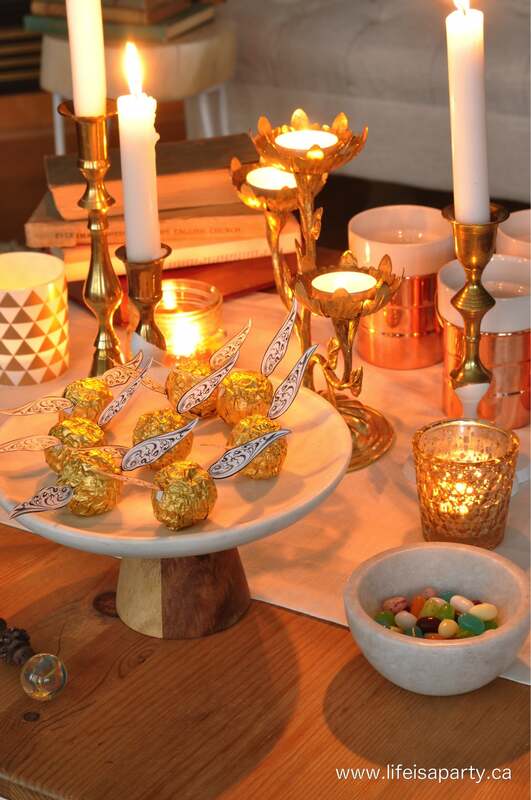 May your life be marked with great celebrations, some as simple as an amazing family movie night. 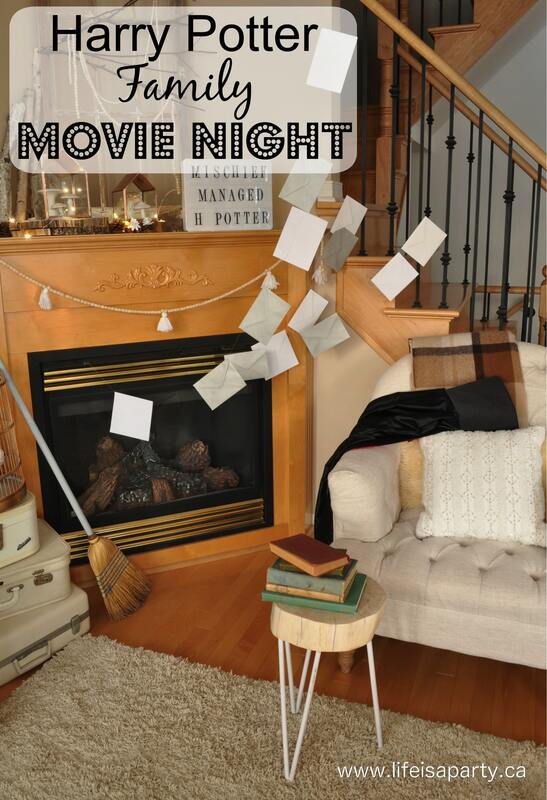 With a Harry Potter Family Movie Night, life really is a party!